NAF in the Pink Senior is designed to keep your older horse looking, feeling & performing at their best, regardless of their advancing years. 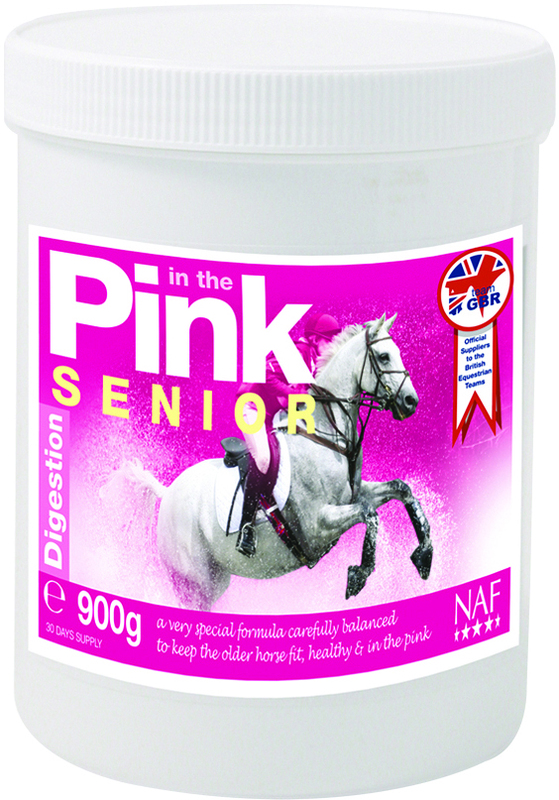 NAF in the Pink Senior supports the natural digestive process, which means that your horse can get the most out of their diet & fully absorb all of the necessary nutrients. Feeding Instructions: Feed maintenance rates for everyday life & feed concentrated rates for times of peak requirement, eg horses that are in poor condition, or travelling. Horses- For Concentrated use feed 40g daily For Maintenance use feed 30g daily Ponies- For Concentrated use feed 30g daily For Maintenance use feed 20g daily 900g will last a horse upto 30 days (based on 30g daily) or a pony upto 45 days (based on 20g daily) 1.8kg will last a horse upto 60 days (based on 30g daily) or a pony upto 90 days (based on 20g daily) 3.6kg will last a horse upto 120 days (based on 30g daily) or a pony upto 180 days (based on 20g daily) 10kg will last a horse upto 333 days (based on 30g daily) or a pony upto 500 days (based on 20g daily) NAF is part of the BETA NOPS scheme.